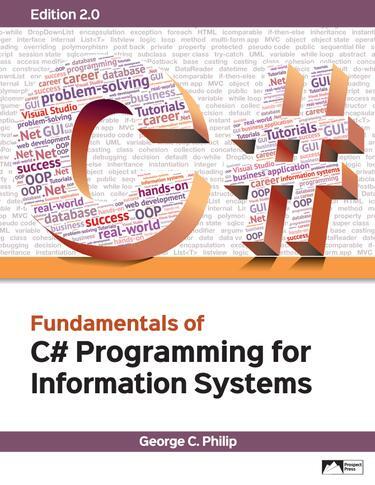 This book teaches the fundamentals of programming in C# to provide a solid foundation to build business and other real-world applications. Programming concepts are discussed in the context of familiar practical applications that use graphical interfaces. A key feature of the book is that programming concepts are introduced in small chunks through examples and illustrations accompanied by hands-on tutorials. The tutorials, which are interspersed with the concepts, help students apply and explore what they learn, immediately. This Edition 2.0 has four new chapters including two on object oriented concepts and two on web application development. This page shows the eBook and the black+white print version. A full-color print version is available for $124.40 at https://www.redshelf.com/book/921586/.